The Chargers are set to sign linebacker Thomas Davis, according to Adam Schefter of ESPN.com (on Twitter). The former Panther and three-time Pro Bowler also announced the news via social media (Twitter link). It’s a two-year, $10.5MM deal for the veteran, Tom Pelissero of NFL.com (on Twitter) adds. The pact includes $5.25MM guaranteed for 2019 and a $1MM roster bonus due next March. The 2019 season will be Davis’ 15th year in the league. The first 14 years of his career were all with Carolina. 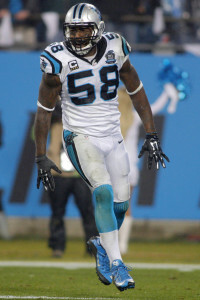 One of the league’s best linebackers for a handful of years, Davis will turn 36 in a couple of weeks and the Panthers thought it was time to move on. Suspended for the first four games of last season, Davis started the final 12 games and had a very solid year. He received above average marks from Pro Football Focus, and graded out as their 19th-best linebacker overall. He’ll be joining an already very talented Chargers defense, and will provide an immediate boost. The Chargers have playmakers on the defensive line and in the secondary, but were sorely lacking at linebacker last year. They recently re-signed Denzel Perryman, who has been hurt most of the past two years, and if he can stay healthy the Chargers will have a much-improved linebacking corp next season. Davis, a first round pick all the way back in 2004, will fill a leadership role on a defense with a lot of young players. Davis struggled with injury issues earlier on in his career, but has been remarkably durable the last handful of years, which is what the oft-injured Chargers desperately need. Longtime Panthers linebacker Thomas Davis says Carolina has informed him they intend to move in a “different direction” next season, meaning the free agent-to-be won’t be playing in Carolina in 2019 (Twitter link). 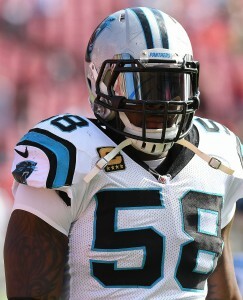 Davis, 35, was a Panthers first-round pick in 2005 and just completed his 14th year with the club. Although he’s vacillated on the subject before, Davis has indicated he’d like to continue his career beyond the 2018 campaign. Whether he’ll still want to do that somewhere other than Carolina is unclear, but he should certainly have a market. Davis only played in 12 games last year due to a four-game performance-enhancing drug suspension, but he graded as the league’s 19th-best linebacker, per Pro Football Focus. He doesn’t seem to be slowing down, as he played in 85% of the Panthers’ defensive snaps a season ago. With Davis gone, Shaq Thompson — who will be playing on his fifth-year option — will become a full-time player (he saw about 60% of Carolina’s snaps last year). A 2017 extension that tacked on an additional year to Davis’ contract will run out in March. Davis will join a group of free agent off–ball linebackers that includes Anthony Barr, C.J. Mosley, Jordan Hicks, and Cory Littleton, among others. Earlier this offseason, Panthers linebacker Thomas Davis made it sound like 2018 was going to be his final season in the NFL. However, the veteran acknowledged last month that he was open to continuing his playing career in 2019. Today, the 35-year-old echoed that sentiment, telling Panthers.com that his impending four-game suspension played a role in him changing his mind. Davis, who finished last season with 52 tackles and 2.5 sacks in 15 games, has been especially upbeat during this year’s training camp. Markus Golden is still working his way back from an ACL injury that ended his 2017 campaign. The Cardinals defensive end hasn’t been able to participate in coach Steve Wilks and coordinator Al Holcomb‘s defense, but he’s still found reasons to be encouraged heading into next season. “Ever since I got injured – especially once I found out I wasn’t going to be in camp – I wanted to encourage guys,” Golden told Darren Urban of AZCardinals.com. “You can tell they are competing. And that’s what I want to see.” Specifically, Golden was pointing to the trio of players who are stepping up in his absence: Vontarrius Dora, Benson Mayowa and Arthur Moats. While Texans running back D’Onta Foreman remains on the physically unable to perform list, it sounds like the second-year weapon is recovering from a ruptured Achilles tendon. “I think he’s progressing well,” coach Bill O’Brien told Aaron Wilson of the Houston Chronicle. “I think he’s doing well. He’s on the right track, and we’ll see. We’ll see how it goes, but I think he’s headed in the right direction.” Foreman’s season ended in November, at which point he had compiled 327 rushing yards and two touchdowns on 78 carries. In case you missed it, the Patriots moved on from wideout Malcolm Mitchell earlier today. The former fourth-rounder had been unable to stay healthy during his stint in New England. In January, Panthers linebacker Thomas Davis indicated that 2018 would probably be his final year in the league. Now, it sounds like the veteran wants to continue his career into 2019, as Joseph Person of the Charlotte Observer writes. The Panthers value Davis, but they also have a younger linebacker in Shaq Thompson that has flashed serious potential at times. If Thompson excels during Davis’ four-game ban, the Panthers could opt to move on from the 35-year-old. Despite his age, Davis continues to play at a high level. Last year, he earned his third straight Pro Bowl berth and finished second on the team with 88 tackles. He also stands as the franchise’s all-time leading tackler. 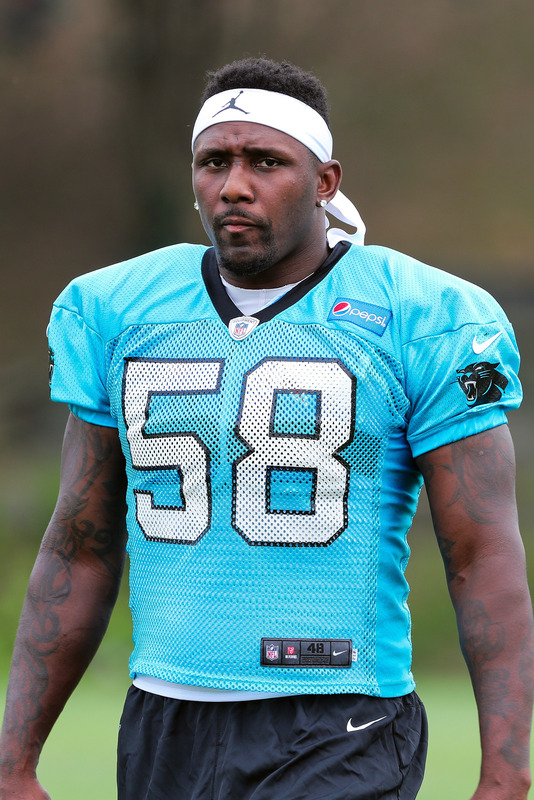 Panthers veteran linebacker Thomas Davis announced Friday (on Twitter) that he’s been suspended for the first four games of the upcoming season for violating the league’s policy on performance-enhancing substances. This is Davis’ first suspension for violating the league’s PED policy. “This is by far one of the saddest days of my NFL career,” Davis said in the tweet, which was accompanied by a video. “I never thought that this would happen to me. I’ve worked extremely hard to do things the right way on and off the field. Panther Nation please know that I am not a cheater. The Panthers have yet to comment on the suspension. Davis said in the video that he was “caught off guard” when he received a positive test for what he said he was an estrogen blocker supplement. Davis, 35, had indicated that 2018 would be his last season but said in the video that it might not be due to the suspension. He’s spent all 13 seasons of his career with Carolina, including three Pro Bowl appearances and winning the Walter Payton Man of the Year Award in 2014. Davis was set to start at outside linebacker in the Panthers’ 4-3 scheme, with Shaq Thompson on the other edge and Luke Kuechly in the middle. Ben Jacobs, Richie Brown and David Mayo are likely to see an uptick in playing time during Thompson’s absence. 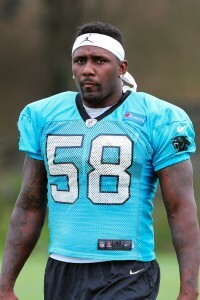 Panthers linebacker Thomas Davis has one more year left in him. The veteran tells Brooke Cersosimo of NFL.com (on Twitter) that the 2018 campaign will be his last. Davis inked a one-year, $6.75MM extension with the Panthers in August, granting him $2MM this past year plus $1MM guaranteed in the coming season. He is aware that he may be asked to take a reduced role in 2018, but he might not be okay with being relegated to a backup role. The Panthers’ Super Bowl hopes were dashed last week when they fell to the rival Saints in the opening round of the playoffs. In his swan song, Davis is hoping to capture the Super Bowl ring that has eluded him thus far in his 12-year career. Davis finished out the year with 76 total tackles and 2.5 sacks. He appeared in 15 regular season games with his lone missed contest coming as the result of a suspension. The NFL has officially reduced Panthers linebacker Thomas Davis‘ suspension from two games to one, the league announced today. Davis was originally banned two games after a helmet-to-helmet hit on Packers wide receiver Davante Adams on Sunday. The NFL has seemingly developed a pattern for these type of offenses: an original two-game suspension, followed by a reduction to one game. It’s the same formula the league used for Bears linebacker Danny Trevathan, who coincidentally was also suspended following a hit on Adams. Now that his ban has been lessened, Davis will miss the Panthers’ next game against the Buccaneers but will now be available for Carolina’s regular season finale against the Falcons. The Panthers, for what it’s worth, are nearly a lock to earn a postseason berth, but have just a 17% chance at winning the NFC South, per FiveThirtyEight. 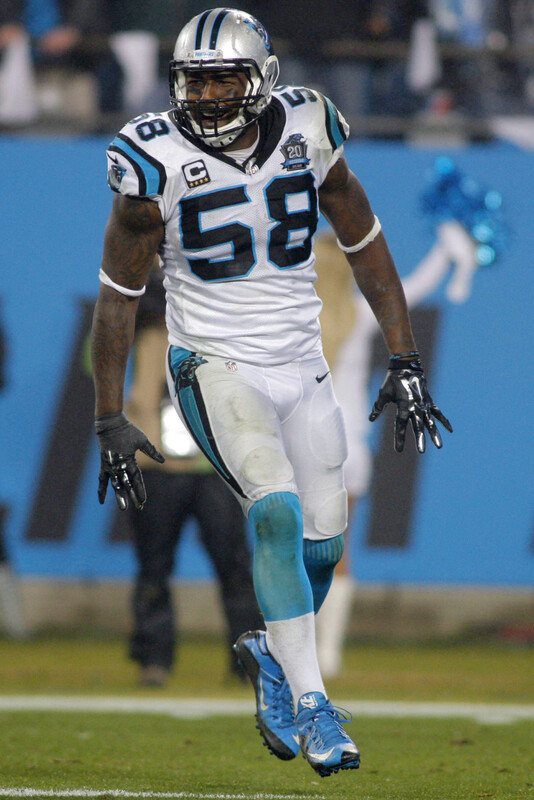 The NFL announced a two-game suspension for Panthers linebacker Thomas Davis. Davis will appeal, according to ESPN.com’s Adam Schefter (Twitter link). It seems unlikely that Davis will get the entire suspension overturned, but he could have the ban cut in half. As it stands, however, Davis is slated to miss the team’s final two regular season games against the Buccaneers and Falcons. The Panthers have nearly solidified their place as one of the NFC’s Wild Card teams. They still have a 24% chance of overtaking the Saints for the NFC South title, according to the New York Times’ playoff calculator. Thomas Davis provided some clarification about his health this week, making a slight correction to his wife’s assessment of an injury with which he’s dealing. During a TV interview, Kelly Davis said her husband was broken “completely broken ribs” for several weeks. The longest-tenured Panthers player said (via David Newton of ESPN.com) his wife didn’t lie and he is dealing with a broken bone in that area, but only one rib is affected. The 13th-year linebacker added the injury has healed to the point he doesn’t have to treat it any further. The Panthers called Kelly Davis’ comments “heartfelt” but “overstated,” noting Thomas Davis did appear on the team’s injury report for multiple weeks due to a rib ailment. Having started each of Carolina’s seven games this season, the linebacker is not in danger of missing Sunday’s game against the Buccaneers. Here’s the latest out of Charlotte. Greg Olsen says he’ll test his surgically repaired foot on the field next week, Joseph Person of the Charlotte Observer writes. That’s when Olsen will first become eligible to resume practicing after going on IR in Week 3. If he’s healthy enough, Olsen could suit up again in mid-November. League rules dictate that players can return from IR after spending eight weeks on the list. Ryan Kalil has played in just two of Carolina’s seven games this season and is unlikely to see action Sunday, although Ron Rivera said the longtime center could play in an emergency situation. Kalil’s dealing with a neck injury, one he aggravated in Week 7 after returning to the lineup. Rivera said (via Jourdan Rodrigue of the Charlotte Observer, on Twitter) the Panthers are not ready to discuss an IR move for the 11th-year snapper. Tyler Larsen has started in Kalil’s place. Luke Kuechly is in the final stage of concussion protocol, needing to be cleared by an independent doctor in order to play this week. The All-Pro middle linebacker practiced fully all week, per Newton, and is just more than two weeks removed from the latest concussion he suffered. Signs point to Kuechly playing against the Bucs. Should Kuechly return after missing just one game, it will mark his shortest concussion-induced absence as an NFLer. He missed three games in 2015 and six last season because of head injuries. Rivera added the Panthers will get Kurt Coleman back after three missed games. The safety missed time because of a knee injury.